It is finally soup season and I could not be more excited! I love something about every season but I’m just going to go out and say that Fall is my ultimate favorite. I love the crisp weather, all things pumpkin and of course Halloween. Nothing makes me more happier than cuddling on the couch with a giant blanket and something warm to eat or drink. I also love the feeling of the holidays being right around the corner. It is a fun time of year. I’ve been taking long, deep breaths lately trying to slow down and take this time of year in. You know, I live in Los Angeles so the weather isn’t quite crisp yet. But it is in the morning and when our weather finally takes a dip into lower temperatures I’ll be ready! 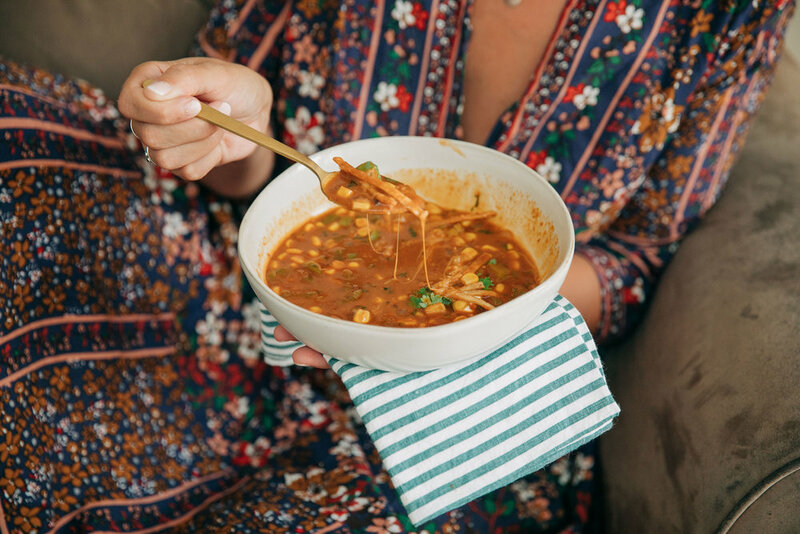 I share my Enchilada Soup recipe earlier this year and so many of you have asked for it again. A handful of you guys even emailed asking me to send it to you. I’ve finally had the time to make it and write it down for you all. I love making this soup sans meat, but you can of course add cooked chicken to it if you’d like. The recipe is below and I hope you enjoy it. I know we’ll be making this a few times a month while the weather cools off. -Begin by prepping all your ingredients. I like to chop my onion, bell pepper and garlic then set them aside in small bowls. If you are adding any additional veggies chop those into bite sized pieces and set aside. Next measure out your spices into a small bowl as well as open up your bean cans. 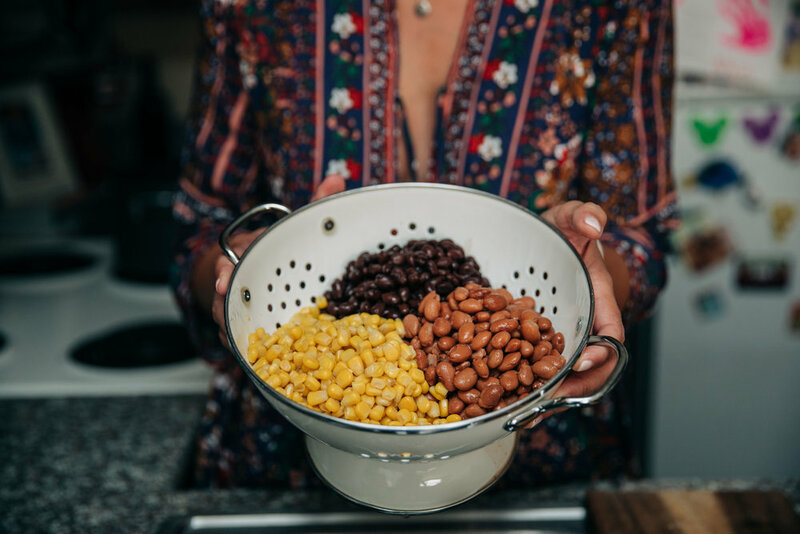 Be sure to drain your beans and corn so you aren’t adding any additional liquid into the soup itself. I also like to measure out my liquid ingredients. A lot of time I prep all this before I go pick up Mila from school or about an hour or two before it is time to put together dinner. You could even prep these ingredients earlier in the day if you found time to do so. Then when it comes down to dinner, all these ingredients come together in about 20 minutes. -In a large stock pot over medium low heat add your olive oil and onions. Stir these and let them cook until they become opaque. -Add in your green bell pepper and garlic to the onions and cook until soft. -To you onion and pepper mix add in your spices. I love cooking the spices a bit here to help them release their flavors and toast them up for a minute. I swear it makes a difference in the end. -Now add your beans and veggies. Our family loves a variety of beans and Mila loves the corn addition. But truly you can cut up any hearty veggie your family loves and add it in here. Stir everything together. -Turn up the heat just a tad and add in your liquids. I like to use a low sodium and organic vegetable stock here. We also love the enchilada sauce from Trader Joes, but any brand will do just fine! This soup is pretty chunky so if you like a thinner soup you can add half of it to your blender and blend it until smooth. Then add that smooth mixture back into your soup. -Cook your soup until it is piping hot through out. If you have added veggies of your own be sure to cook the soup until those are fork tender. -Right before serving I like to stir in fresh cilantro. I also love frying up my own corn tortilla strips which is fairly simple. Just cut up corn tortillas into strips and fry in oil until crisp. Let them cool on paper towels before eating. -Serve your soup hot (or warm if your like my daughter Mila ;) topping with all your favorite toppings and enjoy! Store the store in an air tight container for up to four days. I like to store it in individual servings so when it comes to left overs we can heat up a serving or two at a time.